So, my cheap Ikea couches died on me and we had to get "real" furniture. My new adult furniture has caused chaos in my OCD brain. The couches are beautiful but they've caused me to rethink my whole living room and make many changes. I had to remove a lot of my stuff because the new couches are really big and I really don't like overcrowded spaces. They just make me feel claustrophobic. So, in an attempt to make the new layout homey and personal, I decided to create a photo wall. But I didn't just want a "showroom" kind of photo wall. I wanted it to have some handmade and personal elements. 1. A GOOD quality canvas on a sturdy wooden frame. If you buy a cheap one it will cave in when you stitch. 2. Acrylic paint and paintbrushes. 6. Jute twine or any other "thread" or yarn. It's up to you. 7. Sealant of your choice. I used a polyurethane sealant I found at my local craft store. 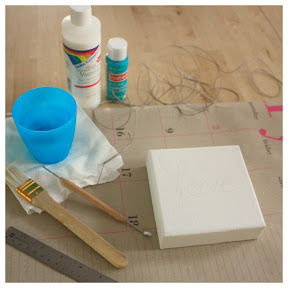 You can also use Mod Podge or anything like that. 8. Pliers- I used these because I have weak wrists but if you're super strong you might not need them. First, using your pencil, lightly write your word. I chose LOVE but you can choose any word that'll fit on your canvas. 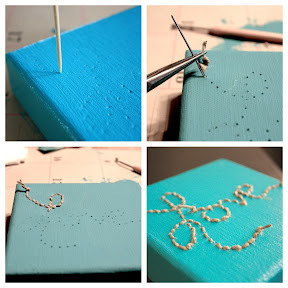 Using your ruler and awl you poke your holes through the canvas evenly spaced. I made my holes 1/4 inch apart. Make sure your hole breaks all the way through the canvas. I actually twirled the awl in the hole to make the hole bigger. This helped at stitching time. When all your holes are done you paint your canvas. I did 3 coats because the canvas was treated with gesso so it needed more paint. After each coat, use your toothpick to clear out the holes and make sure they don't clog. 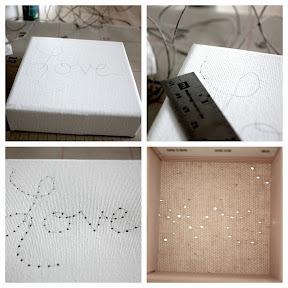 Once your canvas is totally dry you can start stitching. I decided that I wanted the knots to show so I knotted the first stitch up top and then backstitched all the way to the end. I used my pliers to help me maneuver my needle. It is a bit difficult because of the framing underneath. This is why it's important that you have a strong needle and your pliers. 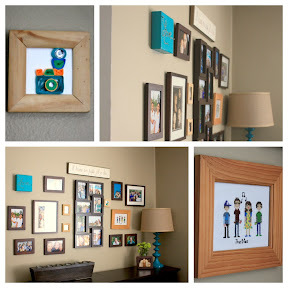 Seal your canvas with your sealant of choice and enjoy your new piece of wall art! Here it is up on my new picture wall. Let me just say that you don't have to spend a lot on a picture wall. I actually got most of my frames from Target and none was more than $8 (except for the collage frame). You don't have to match all the frames but I'm working really hard at being more "funky". Note: Lighting is hard to master. I know that all the pics seem different colors but my wall is sort of cafe con leche and the canvas paint is teal. I'll share more details about the cross-stitch family on another post one day soon. Enjoy your last full-summer weekend. We will be bidding adieu to the season with a weekend in Cape Cod. I'm looking forward to relaxing by the water. REALLY NICE!!!!! LIKE ALWAYS YOU ROCK!!! So happy you love it! I hope you try it out, too! What a beautiful home decor Idea! 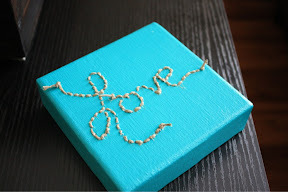 Use of jute twine makes it even more wonderful. Thanks, Pooja. I love the natural look of jute. I'm glad you liked it! A beautiful wall art. I love it so cute. I really enjoy your site, thanks for sharing your ideas. LOVE THIS!! I saw it posted on Pinterest but couldn't link it back to a post. So finally finding the original post is wonderful! I did a variation of this with your work as inspiration. As soon as I can get a post written on it, I will be linking back to you. Thanks so much for your comment! I'm glad you were able to source the pin back to me. (I guess that's the down-side of Pinterest.) Can't wait to see your take on the project.